Wix.com – Ideas For Real Estate ProWix.com hosts Flash and Fancy Modern Day Websites. 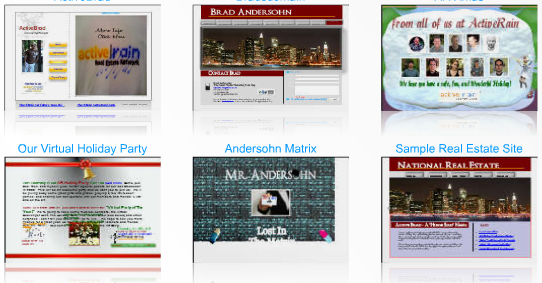 You can create a user name, setup custom websites and web pages, then access them anytime or anywhere from the internet. The user interface is very user friendly, and you won’t need any software of HTML experience. This is a great solution for those of you having to use other web editors which can only be run from your desktop computers. There are endless ways that you could creatively use Wix. You can create individual, independent sites for each of these. You probably have even more ideas now that you’ve seen it. It’s FREE, they host it on their site. You can sent links to anyone you want with your new Library of Tools and Sites just sitting out on the web waiting to be seen by your next clients. You can edit and customize them on the go.Here’s a sample of what Alisa Fedele has done with WIX. Very well done, and easier than it looks or than you may think. Here’s 7 tips to get Google SEO faster according to the Wix Blog. The site Rocks and should at least be checked out by Industry Professionals to see if what Wix has to offer, just might be the right tools for them. Looking for a new website platform, considering a wix site. Was looking to see if there were a list of real estate sites I could see as examples.